This affordable inflatable sport kayak is as lightweight and portable as it gets, yet still remarkably stable and durable. The SeaEagle 330 has a big sister, the 370. It's just 6 lbs. heavier (32 lbs.) and has a carrying capacity of 3 people or 650 lbs. You can carry enough gear for that long weekend trip of fishing, exploring or river running. Form and function make the SeaEagle 370 America's second most popular inflatable kayak. Our most popular model, nice and roomy, comes with canvas covered inflatable seats. Great all round package. In Stock - Ready for Launch! 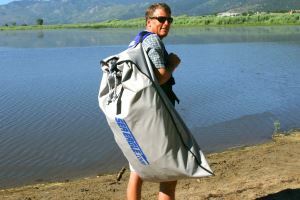 Spindrift Product Review - Fantastic kayak suited to single person or 2 adults. The canvas covered DKS Seats offer increased back support for prelonged paddling. 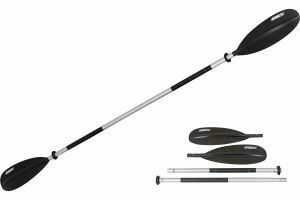 This is our most popular package in the Sport Kayak range. Great all rounder. A great, affordable package for fun on the water. 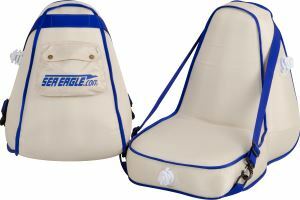 New Carry Bag for transporting your Sea Eagle 330 and 370. Made with heavy duty 440 denier nylon fabric. Measures 26"x48". Thought you might like to know - we tried out our S370 yesterday on our local canal - and were amazed! The boat is so easy to paddle, and very quick - at least as good as the 14 footer I used to have. And The skegs work very well - she tracks straight! . Dave, just a quick e-Mail to say thanks very much for the excellent help and service you provided over the last couple of weeks. I received my Sea Eagle package on Wednesday and have just spent an excellent weekend away with the family in Snowdonia, Wales. The kayak is Excellent, really sturdy and tracks well for an inflatable. I will be recommending you company in future and am already looking to add to the Kayak with the addition of the Sea Eagle Sail. Again, thanks for your help Dave. Hopefully we'll have many years using the Sea Eagle! Fantastic purchase. 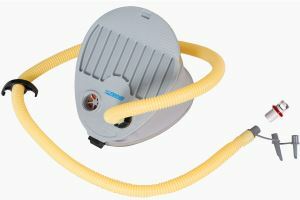 Have used this or two summers now including to Holidays in Spain. The kids have loved paddling out to sea in a safe and reliable product. The product is of the highest standard and everything still looks like the day we bought it even after spending many days at sea and in the sun. The service and delivery was perfect and the advice given prior to purchase was spot on.